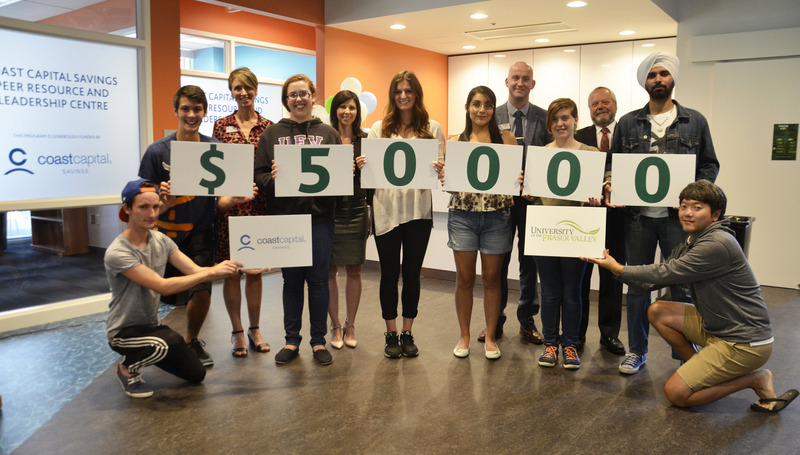 Student leaders celebrate Coast Capital’s donation to UFV. Joining them are Maureen Young, acting director, community leadership, Coast Capital Savings, UFV VP students Jody Gordon, Matthew Atkinson, chief customer experience officer for Coast Capital’s Chilliwack branch, and UFV president Mark Evered. ABBOTSFORD – Coast Capital Savings and UFV are continuing their collaborative partnership by creating the Coast Capital Savings Peer Resource and Leadership Centre. Student leadership and peer-to-peer student assistance will continue to thrive at UFV thanks to a $50,000 contribution from Coast Capital Savings, Canada’s second largest credit union. Located in the Student Union Building on the Abbotsford campus, the centre will provide a safe and supportive environment where students can give other students guidance, resources, and information they require to be successful. This funding is part of an ongoing partnership between UFV and Coast Capital Savings that has helped foster the development of leaders at the university since 2008 and has had a significant positive impact on students’ lives. Since 2008 Coast Capital Savings has contributed $300,000 to student leadership initiatives. Student leaders will receive formalized training in UFV and community service resources and will refer students to the appropriate services as required. The centre will also provide critical and multi-faceted peer-to-peer leadership in a variety of areas including counselling and crisis intervention. Volunteers will be trained in peer-to-peer counselling with guidelines on how and when to refer students to professional services. Student volunteers will also represent a highly skilled leadership group acting as an idea incubator, providing support and guidance to students who are seeking to launch student initiatives. The centre will assist students, so it is fitting the concept was born out of a practicum project completed by Jasper Moedt, at that time a fourth-year UFV Criminal Justice student. Moedt has a passion for helping others, and now as a graduate of UFV, is seeing his hard work come to life with the opening of the centre. Coast Capital Savings is Canada’s second largest credit union, owned by its 522,000 members. It has 50 branches in the Metro Vancouver, Fraser Valley and Vancouver Island regions of British Columbia and has exciting plans to grow. Product innovations include Canada’s first free chequing account from a full-service financial institution. Coast Capital offers one of Canada’s 10 Most Admired Corporate Cultures™ and was named one of 2014’s BC Top Employers. It is a member of Canada’s Best Managed Companies Platinum Club and an Imagine Canada Caring Company. To learn more, visit www.coastcapitalsavings.com.